Every week, we’re sharing our favorite maps, infographics, and videos that highlight the relationship between neighborhoods and health. Tell us what you think and share your own favorites @BHPNetwork. If you’re ever lost, you know the power of a map. But can maps also help tell your story? Last month’s #NetworkCommons offered great insights about the health value of community development—and maps dominated much of the discussion. 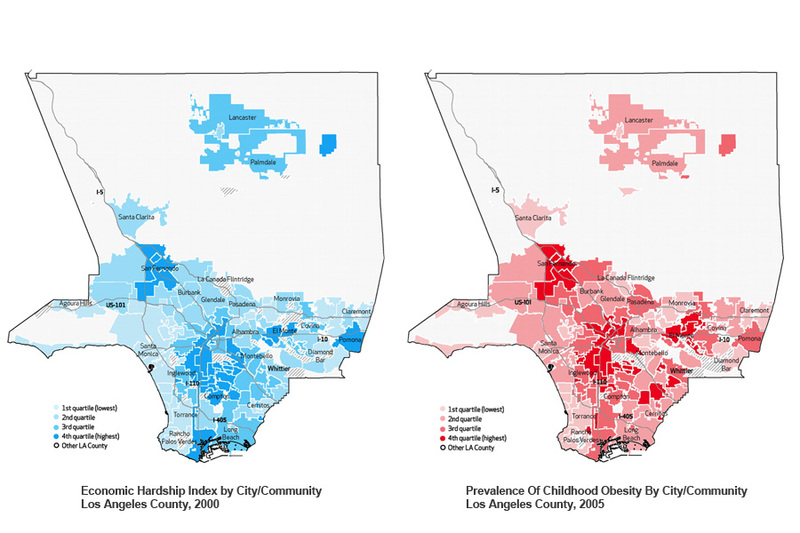 Our speakers resonated with these maps of Los Angeles County, which vividly showed them that the most economically distressed communities – those where community development focuses its efforts – also tend to have the highest rates of preventable diseases such as obesity, heart disease, and diabetes – the focus of public health. Why We Like It: Informative on their own, but together they tell a compelling story. Not only are the same low-income areas most affected by economic hardship and childhood obesity; those working to address these issues are often working in the very same neighborhoods and with the same people, but separately. Where You Can Find It: Several versions of these maps are highlighted in the RWJF Commission to Build a Healthier America’s 2014 report, the Federal Reserve Bank of San Francisco’s recent video on health beyond healthcare, and Sandra Brownstein and Risa Lavizzo-Mourey’s Health Affairs article on cross-sector collaboration. What Do You Think? What maps helped you understand the relationship between neighborhoods and health? Share your own @BHPNetwork #mapsthatclick. These maps were prepared by the Los Angeles County Department of Public Health. Images were compiled from How the Health and Community Development Sectors Are Combining Forces to Improve Health and Well-Being, by Sandra Brownstein and Risa Lavizzo-Mourey, Health Affairs, November 2011.